Most experienced breeders remove and incubate flowerhorn eggs artificially. This, however, is a bit daunting for a newbie. Incubating eggs artificially is more likely to result with less eggs being hatched especially if it’s your first time to breed. It requires in-depth knowledge of the ideal water parameters to achieve a high hatching rate. Letting the female breeder care for the fry is different, though. Using her mothering instinct, the female louhan does everything needed to care for the eggs. 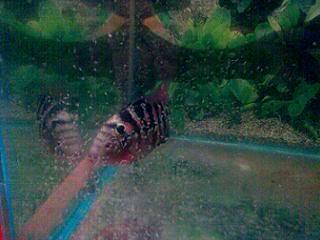 In fact, this is what I did in my first successful flowerhorn breeding project. As far as I can remember, that breeding program produced the highest hatching rate I have ever experienced, around 98%. In cases where the female flowerhorn has been heavily injured while mating, you need to isolate her for medication. Letting her with the eggs may give more stress she could handle. Feed the female enough food and keep her full until the day you separate her from the fry. Do not disturb the female while she’s taking care of her offspring. If the tank is located where people walk around it often, cover its sides. Reduce the aquarium light brightness. Follow the proper ways of preparing fishes for breeding. After the entire breeding process, let the female breeder some time off before you prepare her to lay her for breeding again. Use methylene blue to prevent fungi growth. Eggs that have turned white would no longer hatch. The female fish will clean the area by eating those. 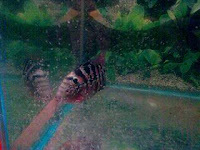 Another advantage of letting the female flowerhorn take care of the fry is that she provides her offspring with their first food. The slime that is found in her skin serves as the first food for the fry. The slime if fully consumed in around 1- 2 weeks. Remember to supplement this by providing the fry with the smallest feed available to you. When you notice her skin start to turn dark or pale, her skin might be running out of slime already. This exposes the female to skin infection. At this point, you have to her from her fry. You don’t have to worry about the fry. During this phase, the fry could already take care of themselves. Just feed them often, around every 3 hours if you are able.